The first ranch in this area was set up on the Niobrara River about five miles south of here in 1877. E. S. Newman established his ranch to sell cattle to the government for delivery to the Indians at the Pine Ridge Agency to the north. The sandhills, later to become the heart of Nebraska's cattle country, were shunned by Newman and his contemporaries who set up ranches on their edge. The cattlemen believed the region of shifting sand dunes, with few streams or other known sources of water, would not support cattle and was even dangerous for humans. In the spring of 1879, Newman and his fellow ranchers were forced to enter the sandhills hoping to salvage a small portion of the stock that had drifted south of the Niobrara River in the severe winter storms. They found the cattle had both shelter and good grass and water in the hills. Since then Nebraska's sandhills have acquired a thicker and more stable covering of grass. This rolling country with its plentiful vegetation and its diamond-like lakes nestled between the hills has become one of the most productive cattle-raising regions in the world. 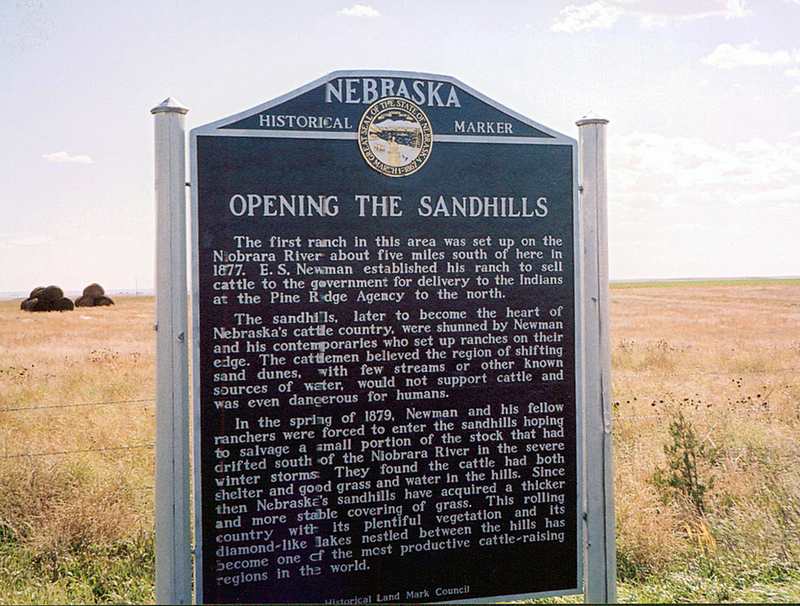 “Opening the Sandhills,” Explore Nebraska History, accessed April 18, 2019, https://mynehistory.com/items/show/64.